Great news for Waterford’s youngest students, the community, and taxpayers. To begin, WGSD had a very successful first year in 2015-16 as we completed our first year of district-wide four-year-old-kindergarten (4K). Many thanks to our dedicated 4K teaching and support staff, building principals, and district administration. It will be exciting to see how our 4K program impacts student achievement as these students progress through their schooling. For those that are interested, it was back in August of 2015 that the school board approved the curriculum that would be used for 4K, called the Wisconsin Model Early Learning Standards. 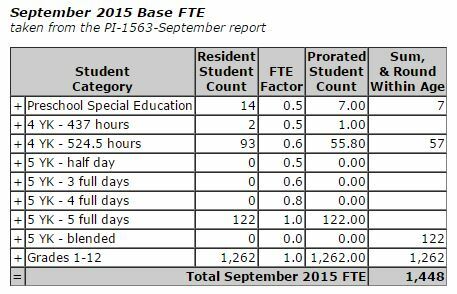 As can be seen from this school district report, last year’s 4K program had 95 participants. Because our 4K program was half-day with a parent component, each student was counted as six-tenths (0.6) of a full-time K-8 student. As a result, and for the purpose of state aid membership calculations, the 4K program elevated our district enrollment by 57 students. 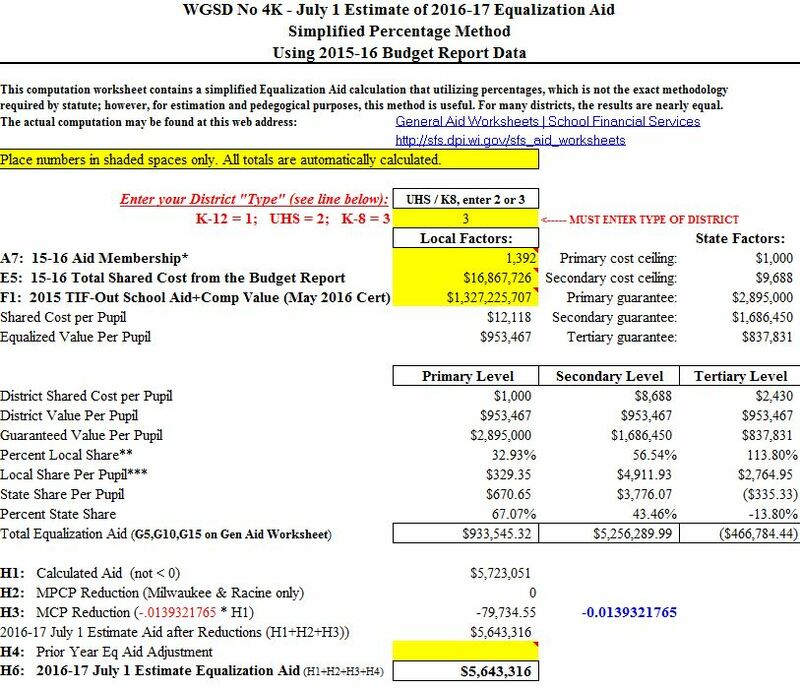 After 5 straight years of declining enrollment and a resulting shortage of almost $9 million in state aid over those same 5 years, the 2015-16 school year was the first year where our WGSD enrollment increased. This year WGSD is receiving approximately $700,000 more in state aid due to last year’s 4K program. 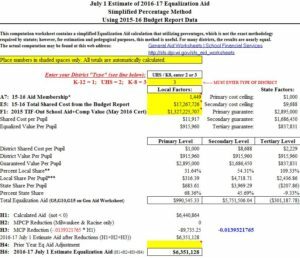 Fortunately, our district-wide 4K program only costs about $400,000 annually to run. As a result, and regardless of future district enrollment, having a 4K program in place assures not only a free and quality 4K curriculum for all of Waterford’s youngest students, but an annual savings to local taxpayers of $300,000. 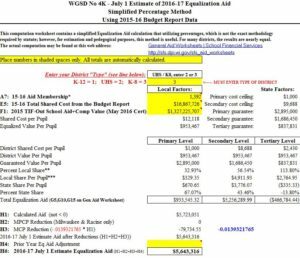 The above-referenced numbers were recently confirmed by our WGSD administration, and I am providing my own calculations below that were made using the worksheets that are provided by the Wisconsin DPI. The page on the left is the state aid calculation “With 4K” in place. 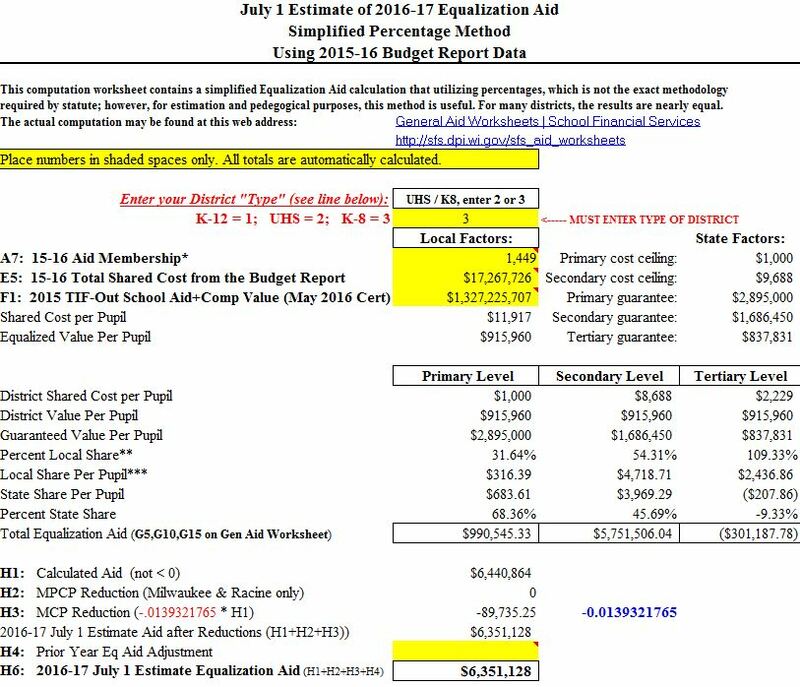 The page on the right is the state aid calculation “Without 4K” and a reduction in shared costs of $400,000. Click to enlarge.